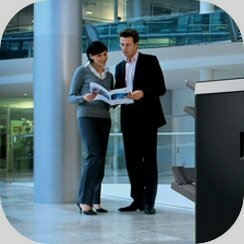 ​We offer prompt, efficient, and organized office relocations for local & corporate customers. 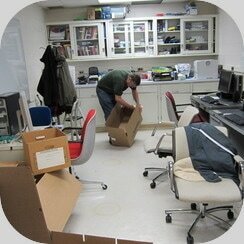 Our team is well equipped to handle all of your office relocation needs. We appreciate that time means money in the business world and we want to help you move with minimal disruption to your normal operations. Whether it’s moving a one-man operation or the head office of a major corporation, we offer a full range of services, including; project management, free estimates, on-premises packing, cross-continent cartage and, of course, door-to-door pick up, and delivery. Our trained crew has experience of dismantling and re-assembling of complex work stations and is accustomed to moving even the most delicate items, such as computer equipment, servers, valuable art and antique furniture. We pride ourselves on our speed and efficiency throughout the entire office relocation process, ensuring that your business is up and running on time, every time. To ensure the safe transfer of your office files, equipment and furniture, we supply a range of office boxes and crates that are suitable for many of your office items including PCs, telephony and IT equipment. We guarantee the correct number and type of crates are delivered to the right location at the right time to support your move schedule.